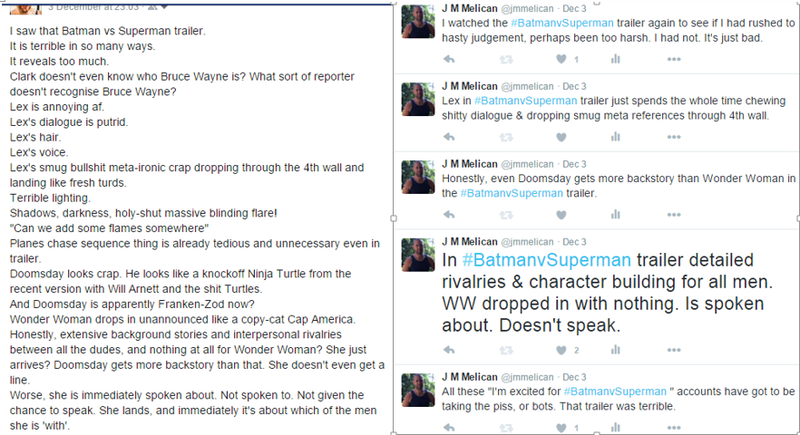 So I recently launched a bit of a rant on my Twitter and Facebook about the new Superman vs Batman: Dawn of Justice trailer. I am not the only one who has had a problem with this trailer, and I didn’t even pick up on my first viewing that Batman has a gun in his hands. A gun. Batman. Now these represent a kind of frivolous ranting, I understand that. A friend tweeted me a rejoinder from Purple Hippo against which I offer no defence. Another friend, an unabashed DC fan, challenged me to be more positive about it, and this challenge did strike a chord. It is easy, after all, to be critical from behind a keyboard and launch barbs against the creative endeavors of others. Too easy perhaps, such that one falls into the role of the vandal too easily, tearing viciously at art they do not appreciate. I haven’t even seen the film (obviously), and no doubt my general distaste for Zac Snyder’s films and my bitter disappointment at the last half of the previous Superman tainted any objectivity I may have had. That said, the previous (shorter) Dawn of Justice trailer actually had me pretty hopeful for what this film could be. This most recent one burned that hope to ashes. Superman is a difficult character to write into a compelling story because so much of narrative depends on conflict and stakes. For Superman, there can be no meaningful external conflict. He can defeat any enemy at will and is impervious to any attack. What threats can he be made to face? And what can be at stake? Not his own life, so must it be those he cares about, must we perpetually have Lois Lane endangered to give Superman a reason to act? The response to this has either been even more incredibly super-powered enemies (a narrative arms race which quickly succumbs to absurdity), or weakening Superman with kryptonite. This latter approach is the better, but fraught, because if the enemies use of kryptonite becomes inevitable in every Superman tale, it moves from his one vulnerability to a hackneyed deus ex machina. An alternative approach is to focus less of Superman’s external conflicts, and more on the internal. This is the truly fascinating question of Superman, for me. ‘If I had unlimited power, how would I use that?’ Superman should lead us to ask how we could decide when to act, and in whose interests. We should questions how we would manage the competing urges to altruism and self? He should be forced to choose, for instance, whether to save Lois Lane (a single life he cares greatly for) or the passenger jet about to crash (hundreds of strangers). He should have to agonise over which disasters he prevents, and which he allows. How, after all, could he justify intervening in a bank robbery in Metropolis if he could instead prevent an African warlord from slaughtering a village, or a drone strike destroying a hospital, or a suicide bomber in a football stadium, or a gunman in woman’s health clinic, or a drug cartel kidnapping the wife and child of a good cop? The best story of Superman, would be one of these moral conflicts. 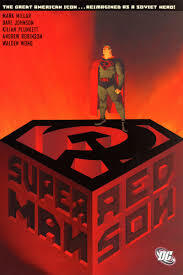 Red Son exploited this by having Superman raised in Stalin’s Russia, and asking how we would feel about his powers if they were in service to that ideology. Snyder seemed ready to offer us this film in ‘Man of Steel’ (such as when Kevin Costner questioned whether it was a good thing for young Clark to have saved the bus), but then reverted to Supes punching people through buildings for 30 minutes. So in the interests of positivity, here’s my attempt. I have assumed a few elements as required. The central trio of Bats, Supes and Wonder Woman. That Lex and Doomsday appear as villains. That this follows on from ‘Man of Steel’ so that the events of that film are present as background to this, the characters in this must act consistently with a world post-‘Man of Steel’, a world in which Kryptonians have fought their way through Metropolis, and in which Superman broke Zod’s neck. I think the casting of the film is pretty good, I have no particular problem with Batfleck, Cavill is a good Supes, Gadot perfect for WW, Adams as Lane, Eisenberg should be a good Lex, for all he annoyed me in the trailer. If I needed to cast Catwoman, Emily Blunt would be amazing. I have added a few elements, and considered how this would set up subsequent films on a trajectory toward Justice League. Lois Lane and Clark Kent have come to Gotham to attend a journalist award ceremony. She is being recognised for her work on an investigative feature for the Daily Planet exploring issues arising from the revelations of extraterrestrial life life, particularly Kryptonian. She will later speak at the UN about the issue. At the award ceremony she and Kent meet Bruce Wayne, who is a corporate sponsor of the event. Wayne Enterprises owns the hotel they’re staying in. When they return to their (separate but adjoining) rooms they find they have been ransacked. It soon becomes clear that this is true of several attendees to the award ceremony. Lane reports the theft. Wayne excuses himself, deferring Lane to Lucius Fox, who promise that action will be taken. Wayne, as Batman, follows a trail of clues from the building across Gotham’s rooftops. Kent, as Superman, is unseen above. He follows Batman, suspecting that he is the thief. He closes the distance, but Batman senses him and escapes. Supes returns to the hotel, and as Kent begins his investigation into the Gotham vigilante. Batman returns to the batcave, his pursuit of the thief interrupted by Superman. He begins his own inquiries into the Kryptonian, which lead him to Lexcorp, a private contractor for space-faring tech which has been brought in on a private consultancy with US govt on the matter of Zod. He knows Lex Luthor’s reputation in corporate circles: a young entrepreneur with an air of the eccentric genius. He shares with Alfred his concern at seeing the Kryptonian in Gotham’s skies, and decides to prepare a defence. But first he returns his attention to the theft from his hotel. He has a suspect. On the screen we see a shot of Selena Kyle. Lex is still in Metropolis. We see him reporting to government agents on what he has learnt from his study of Zod’s corpse. He has become fascinated with Krypton, and has been searching everywhere for more signs of their presence. He reveals that he has detected an asteroid with traces of Krypton, likely a fragment of that planet, having traveled through space since the planet’s destruction. But when he plotted its trajectory, he saw that its approach to Earth is too perfect to be chance. He plans to intercept it as it approaches Earth’s atmosphere. At the UN Lois Lane gives her speech to the assembled world leaders. Among them is Diana Prince, an employee of the UN. She requests a private audience with Lane, and there asks how Lane knows Kryptonians can be trusted. Lois tells her tale, and Diana tells her about the asteroid Lex is tracking. She is worried that the US gov’t, and that a private company in Lexcorp, will keep the study of the asteroid from the rest of humanity. She’s concerned that it may be weaponised, either by the US, or by Lex. Lane sees a story in it and decides it’s worth investigating. Batman has tracked the theft back to Selena, and he confronts her. She tells him that she has sold what she stole on to Gotham underworld. Batman is about to let her go, on the promise that she will leave town, but Superman descends from above and insists that she face justice. Batman challenges Superman’s idea of justice. He accuses him of being a tyrant. Calls him an executioner for breaking Zod’s neck, blames him for the damage to Metropolis from the fight. Superman calls Bats a vigilante, accuses him of disregard for the rule of law. Batman argues that he does so to ensure order, that law is not always the moral good. Superman says that people as powerful as he and Bats can’t afford to think that way, that they become tyrants if they consider themselves above the law. They fight: Superman alone vs Bats and Catwoman as a team. Bats pulls a trick, escapes with Selena. Superman briefly pursues, but allows them to escape because Batman’s criticisms have touched him and he decides that he doesn’t want another fight, as with Zod. Instead he decides to use more official channels. He has, through his super senses, established that Bats=Wayne. He goes to the DA, Harvey Dent, and together they hatch a plan to bring Bats in legally. He doesn’t reveal Bats’ secret identity, because he doesn’t want to prejudice Dent’s investigation. Later, Lois tells Kent of Diana’s fears about Lexcorp. He is supposed to be meeting soon with Dent to enact their plan to catch the Bat, but he decides that it is more important for him to stop this fragment of Krypton falling into Lex’s hands. Once away from Lois, he becomes Supes and flies into low-orbit to interfere with Lex’s plans. As a result, he’s not present when Dent needs him. Dent follows through with the plan he had to catch Bats, but without Superman’s assistance, it back-fires disastrously. He is badly wounded in an explosion. Batman saves Dent’s life, and takes him to hospital. He makes his way to the roof, worried that his efforts to do good in Gotham have inadvertently hurt one of the city’s good guys. He sees shooting stars above. In the upper atmosphere Supes is trying to stop Lex from getting to the meteor. He gets caught in a dogfight with Lex’s aircraft and with US Air Force fighters. He defeats them, breaking away in one instance to save a pilot whose ejector seat fails. When he gets close to the meteor, in his attempt to deflect it back into space, the Kryptonite it contains robs him of his powers. He falls, with it, but away from it, and as he falls farther from it his powers regain, so that he survives his landing in a Gotham park. Some blocks away, the meteor has also landed. It is a capsule, the same sort as the one by which he, as Kal-El, escaped Krypton. Doomsday steps out. Superman is still weak, and is weakened as he gets closer to the capsule, but he still tries to fight Doomsday. As it seems that he has been overwhelmed, Batman (in his anti-Supes suit) comes to his aid. When Doomsday gets the better of Batman, WW arrives as well and joins the fight. Between the three of them they subdue Doomsday. Afterwards, Lex reveals to the media that Superman actively prevented him from intercepting Doomsday’s pod in orbit. Lex blames Supes for Doomsday reaching Earth and for all the damage done, first to Metropolis, now to Gotham. Public backlash against Supes increases. Lois Lane is an increasingly isolated voice in a media calling for increased accountability and regulation of Superman’s actions. Batman returns to the batcave, badly beaten and facing a crisis of confidence. He tells Alfred that he must upgrade his defences. He needs Kryptonite, because of what might yet come down from space, and because he needs to be prepared in case the Kryptonian already on Earth turns bad. He knows now that there are greater threats in the world than Gotham’s criminals. Dent awakes, as Two-Face, blaming Batman and Superman for the injuries he sustained. He swears revenge on both. A scene with Selena and Diana reveals that she was the recipient of the info Catwoman stole from Lane. She returns to Themyscira, knowing more now about the Kryptonians, and determined to prepare her people against them. The final image is of Doomsday in restraints being delivered to Lex, who has been working with the Kryptonite salvaged from Doomsday’s pod. He slots one of the green crystals into his mech suit, climbs in, and lifts Doomsdsy easily. So there it is. My attempt in the space of a few hours of my spare time to outdo the combined efforts of several professional script-writers and film-makers who have been at work for months on a multi-million dollar budget. What ridiculous hubris I have. Please feel free to endorse my vision, or to feed me a taste of my own medicine by way of scathing comments below. This entry was posted on Sunday, December 6th, 2015 at 6:24 pm	and tagged with Batman, Batman Vs Superman, Cat Woman, Dawn of Justice, DC, Lex Luthor, Red Son, Superman, Wonder Woman, Zac Snyder and posted in Musings. You can follow any responses to this entry through the RSS 2.0 feed.